Turning professional as a teenager and facing snooker's finest would normally guarantee top billing in the sporting prowess department at family gatherings. But 17-year-old James Cahill has some way to go before he can lay claim to being the best snooker player in the Cahill clan. 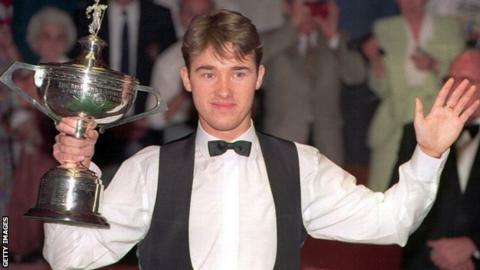 His mum's sister Mandy is married to Stephen Hendry. That means there is just a small matter of seven world titles to rack up to be on equal terms with "Uncle" Stephen. Cahill first started taking an interest in snooker at the age of four and used to watch his mum play on the women's tour. He left school at the age of 15 so he could focus on his snooker and was privately educated. Cahill won the European Under-21 Championship in Serbia in March this year. He turned professional at the start of this season and has a two-year tour card. Cahill's best result this season saw him reach the last 32 of the fourth European Tour event in Germany where he lost to world number 15 Ali Carter. Cahill, whose mum Maria also played on the women's circuit, is not one to be daunted by either Hendry's considerable presence - or settling in to his first season as a pro. "He's the man isn't he? He was an incredible player. You can't help but learn from someone like that," Cahill told BBC Sport. "We used to practise a bit but that's not been so easy recently because he's been to China quite a lot." But Cahill says the general advice and support the Scottish snooker legend provides has been invaluable. "So much of the game is in the head," Cahill added. "And he always tells me to keep putting the hours of practice in, stay relaxed, keep my chin up and the results will come." Cahill's debut season has been a tough introduction - but the Blackpool-based potter fully expected that. He has been happy with his form and says he is revelling in the experience of being on tour and mixing with the world's best. His standout victory came in August in the fourth European Tour event of the season in Germany when he beat former World Championship finalist Nigel Bond on his way to the last 32. Cahill then went close to causing an upset against Ali Carter before losing 4-2. "I have felt comfortable in every game to be honest," Cahill said. "And I am feeling better with every game. "I think I fancied winning against Ali as much as he did. He is a top name and a great player but I had a really good chance to go 3-2 up. I missed a brown and he won that frame and then potted a good long red in the next frame. "That's the thing - you can't leave the top players anything because they will take advantage." Cahill, who won the European Under-21 Championship in Serbia in March this year, has also faced former world champions Steve Davis and Mark Williams this season. "I'm loving every minute of it," he added. "I've not been playing too bad. It's just such a big jump from junior level. "Things could have gone better but I am pretty happy with my form. It was always going to be tough in the first year and I am learning so much. It's brilliant experience. "Everyone is so good and it's a bit of a rat race but you keep learning, keep practising and I know the results will come. Everyone I speak to says the first year is just about learning." The fact that Cahill has a two-year professional tour card means the pressure to perform is lessened slightly and he can take some time to adjust. He will be learning in one of snooker's "Big Three" on Friday when he takes on the in-form Joe Perry in the first round of the revamped UK Championship in York. "Playing Joe will be tough. He has been playing really well but I'm just enjoying everything about the tour. "I will still go for my shots - as long as it's the right shot. I have got a good long game but you have to play the percentages." There is no doubting his belief. And his desire to forge a career is also beyond question. Cahill left school at 15 and was privately educated so he could fully concentrate on his blossoming snooker career. "My focus is all about snooker," he explained. "I'm fully committed to it - it's what I want to do."